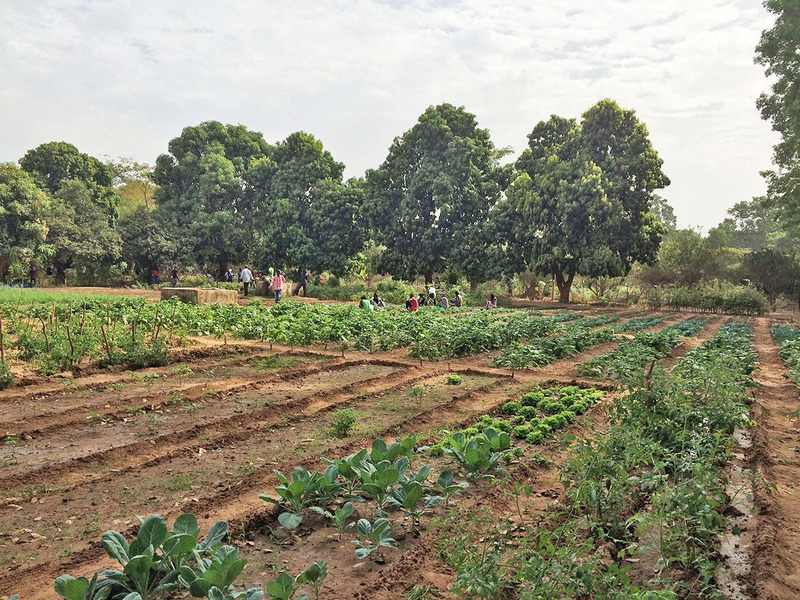 As a Farmer-to-Farmer (F2F) recruiter, my role is to find volunteer agriculture experts that can provide the most positive and measurable impacts to our assignments. I receive the greatest job satisfaction hearing about the volunteers’ experiences and reading the updates from the field staff on impacts. However, it isn’t often that recruiters are able to witness these impacts first-hand. I recently had the opportunity to travel to Myanmar and Nepal to do just that. In Myanmar, we visited two Farmer-to-Farmer host organizations, which provide assistance in livelihood development for local women in Pindaya and Nyaung Shwe. We then travelled to several villages to meet with the female participants of soap making and business management assignments to see how they were utilizing their training. What struck me was the hospitality shown during each visit. There wasn’t a meeting that didn’t involve green tea and delicious local snacks. We listened to the women’s stories of their opportunities and challenges in starting new businesses, while we munched on rice cakes and fried potatoes. They were excited to share their successes in making new soap products using avocado, tomatoes, lotus pollen, coffee, etc. 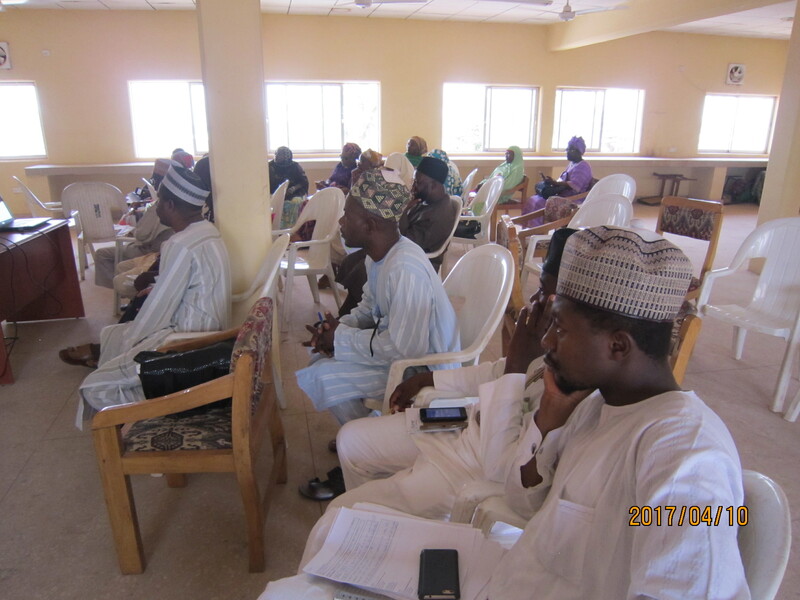 A few groups eagerly presented their meticulous business management records that were created based on the F2F volunteer’s advice. The women’s groups agreed their ultimate goal was to see sustained profits and business growth. Many of these groups are already well on their way to achieving those goals. While in Nepal, we traveled to Ramechhap district to meet with youth entrepreneurs who benefited from F2F training on business management. Entrepreneurship seems to come naturally to the people we spoke to. They work hard and have an eye for market opportunities. F2F training helped them build confidence to invest and make informed business decisions. We toured the plant nursery of one of the participants. His enthusiasm was infectious. He is proud of his successes, and the way he has grown his business after applying the techniques he learned in training. He wants to help other young people in his area and surrounding districts to experience the same. The sense of collectiveness in Nepal is inspiring. One can see that even the smallest amount of assistance can and will be replicated to build rural economies. In my role, it can be difficult not to view volunteer assignments in terms of flights booked, visas received, travel advances sent, and paperwork completed. 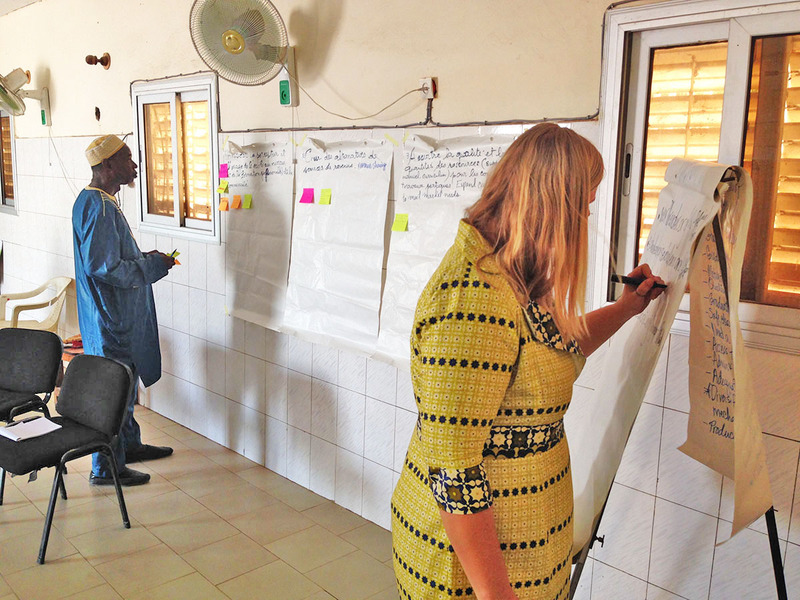 It is easy to get lost in the minutiae of recruiting and mobilizing volunteers. Seeing these assignments and their impacts through the lens of a volunteer and the participant has heightened my sense of pride for the Farmer-to-Farmer program, Winrock’s field staff, and the work we do at headquarters. “As I got off the plane in Lagos, Nigeria the anxiety of what I was about to encounter was enormous. I put on my Winrock hat and pin that would identify me when I arrived at the airport. I thought to myself were the PowerPoint’s that I worked on ready? Did I fully know what the situation of power and computer programs were going to be at the college? and would my material be compatible with what the situation was at the college? Would the people in Zaria accept what I was going to introduce to them? After a few days, I arrived in Kaduna by plane. The country director Mike Bassey accompanied me on the flight from Lagos. As the plane descended into the airport, I could see thatched roofed huts just outside the city. There was a haze of smoke that wafted through the air. There were trees that stood between grassland and areas where farmers were burning the savannahs. We met Blessing at the airport, my driver, and then started the hour-long journey to Zaria. 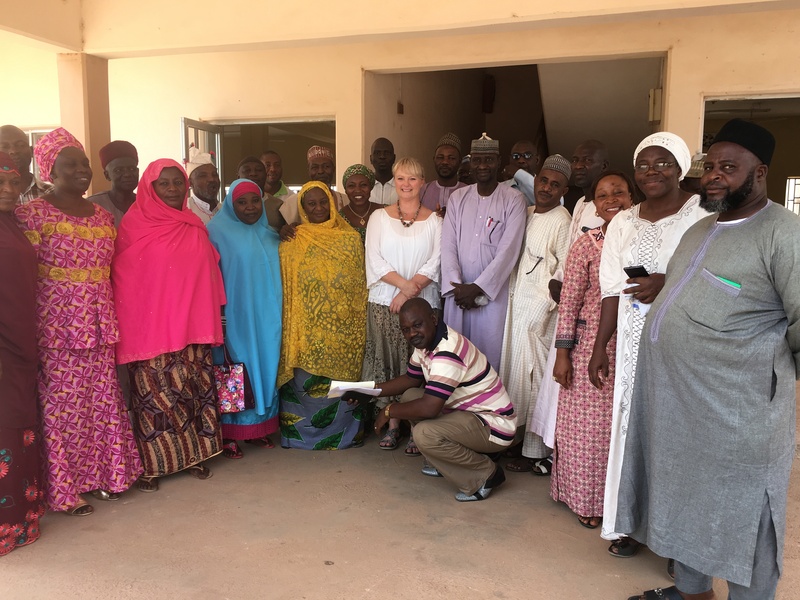 As I arrived in Zaria and met the college president, provost, and other dignitaries, they met me with a welcoming message and a thank you for taking the time to visit their college. When I met my class of about 31 students, 12 female and 19 male, I felt more at ease. The power in the classroom was intermittent but they fired up a generator so I could use the computer and projector. 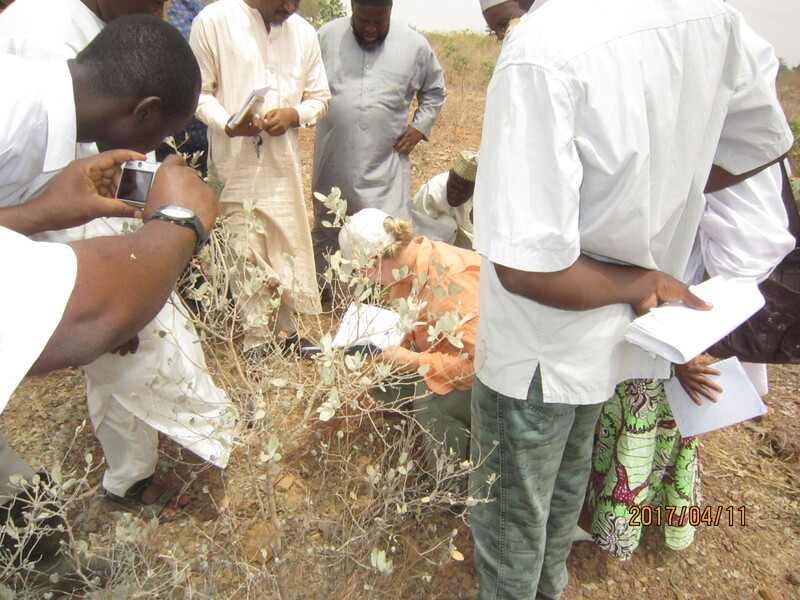 My 10 days in Zaria were some of the most amazing that I have ever had. We worked on pedagogical skills, curriculum development and program level assessment. We were able to do one field day at an agriculture research college and I went over some rangeland monitoring techniques. 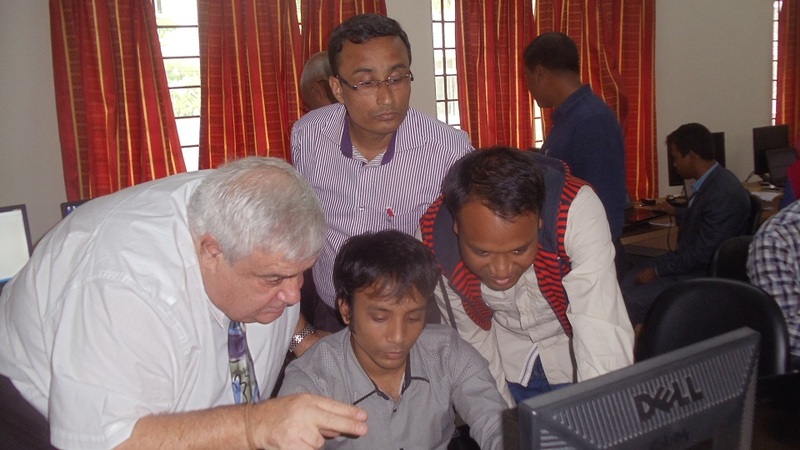 This week’s blog comes from F2F volunteer, Thomas Sallee, who traveled to Bangladesh to build the capacity of faculty and students from Khulna University Life Science School and Sylhet Agricultural University on advanced statistical analysis in agricultural research. Mr. Sallee is an agricultural economist and a former agent with the United States Department of Agriculture National Agricultural Statistics Service (NASS). He also has experience working in nine developing countries where he has designed software and management systems for agricultural data and provided training on data collection, database design, survey design, and data analysis using statistical software packages. “When I arrived in Dhaka I expected a lot of traffic and I wasn’t disappointed. Honking horns from rickshaws to compressed natural gas (CNG) vehicles to buses surrounded me. But I never saw any accidents during my entire stay. Dhaka is a large modern city with high-rise buildings and nice hotels. Flying to Jessore on my way to Khulna was quick and easy and the drive to Khulna took me through some beautiful countryside. Even though it was the end of the dry season, the irrigated rice paddies were lush and green and seemed to stretch on as far as I could see. Khulna is a divisional city with many modern buildings and shops filled with fashionable clothes and the hotel where I stayed was as nice as any I’ve stayed in back in the States. The people I met were friendly and courteous. Participants involved in the training I was providing at Khulna University were knowledgeable and quick to grasp new ideas. They were also hospitable and invited me to a barbeque of delicious chicken. 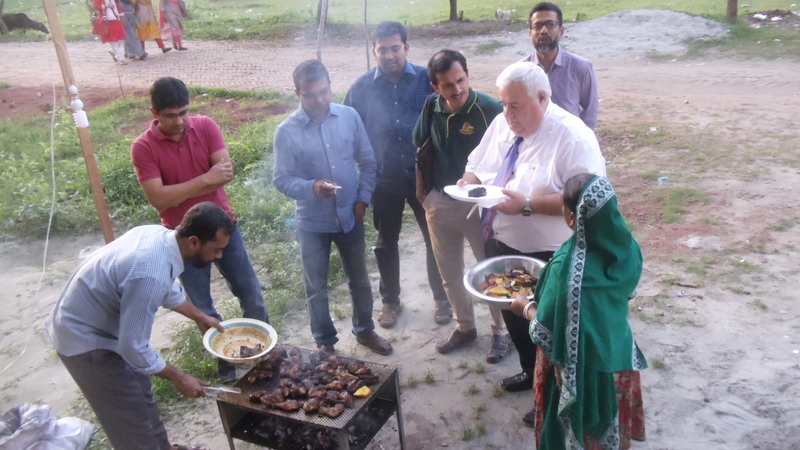 I enjoyed all the food in Bangladesh, but the friendly atmosphere of the barbeque made this meal particularly pleasant. Traveling to Sylhet I saw a different landscape full of hills and tea gardens. I had never seen tea being grown before and it was interesting to see the sturdy green shrubs clinging to the sides of the sometimes rather steep hillsides. I wondered how the harvesters could trudge along those narrow paths carrying baskets full of tea on their backs, but it is all they do for a living and they seem to have learned how to overcome gravity. A tour of a tea drying plant, which was founded in 1875, was also quite fascinating. I was invited to a dinner party by the participants in the training at Sylhet Agricultural University. This was a banquet at which various participants played the harmonium, drums, and the flute, accompanying themselves beautifully as they sang songs composed by their Nobel Laurate, Rabindra Nath Tagore. Finally, the group sang several traditional folk songs with quite a lot of gusto and hand clapping. After a delicious meal, they kindly presented me with a miniature rickshaw, which is the customary gift for visitors to Bangladesh. They also graciously gave me a gift of a purse to take to my wife back home. Although Kabaddi is their national sport, cricket is very popular in Bangladesh. While I was there, Bangladesh beat Sri Lanka in Test cricket for the first time ever and became the fourth team in the history of cricket to win their 100th Test match. The whole country was celebrating. Everyone was more than happy to explain what was happening and by the end of the second day I could almost keep up with the play-by-play announcers. Test match cricket is the longest form of the sport of cricket and regarded by players and serious cricket fans as the ultimate test of playing ability as compared to one-day international cricket. Test matches are played only between national representative teams selected from the best players within a particular nation. This week’s blog comes from F2F volunteer, Dr. Peter Flanagan, an experienced professional in ruminant farming, including dairy production and reproduction management (goats, sheep, and cattle). He also has extensive international development experience and has worked in South Sudan, Pakistan, Azerbaijan, and India. He currently resides in Guam, where he has established a veterinary clinic. 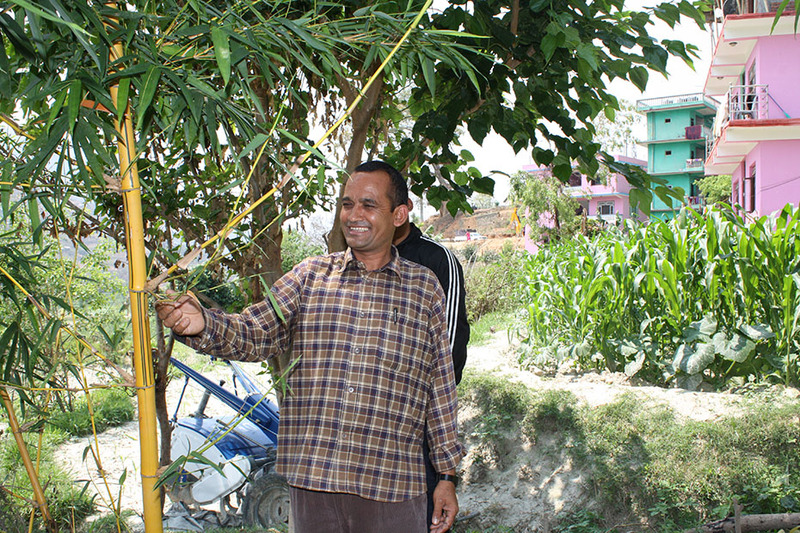 He recently returned from Bangladesh, where he provided training to youth goat farmers and host staff on improved goat rearing techniques, including climate-smart adaptation practices. “Standing in the long line at the immigration desk at the Dhaka International Airport provided ample opportunity to wonder what the next two weeks would be like. As the assignment unfolded, it turns out that the 2 hours needed to obtain the visa was more likely the result of unfortunate timing rather than an omen of things to come. Once the logistics were under the direct control of Winrock management, travel was easy. No other significant delays hampered the smooth flow of the remainder of the trip. Upon arrival at the Winrock International office, I received a warm reception by Dr. Kabir, Dr. Rahman, Mr. Badal, and other Winrock staff. The program managers provided clear guidance on what the assignment would entail and were especially thorough when reviewing the safety precautions, which were followed conscientiously by the entire staff for the duration of the assignment. After a long night on several airplanes, it was pure pleasure to plunge into the luxurious comfort of the Bengal Inn, which is located just around the corner of the Winrock offices. The first thing in the morning, my companion for the next 10 days, Dr. Rahman, joined me for the short flight to Jessore, followed by a 2-hour drive to the headquarters of Satkhira Unnayan Sangstha (SUS), my host for this assignment. For the remainder of the assignment, Rahman was a good-humored companion who assured that everything flowed smoothly from his invaluable translations, to his seamless coordination of various activities, to his willingness to provide insightful cultural information. We were greeted warmly by the SUS staff, including Mr. Sk. 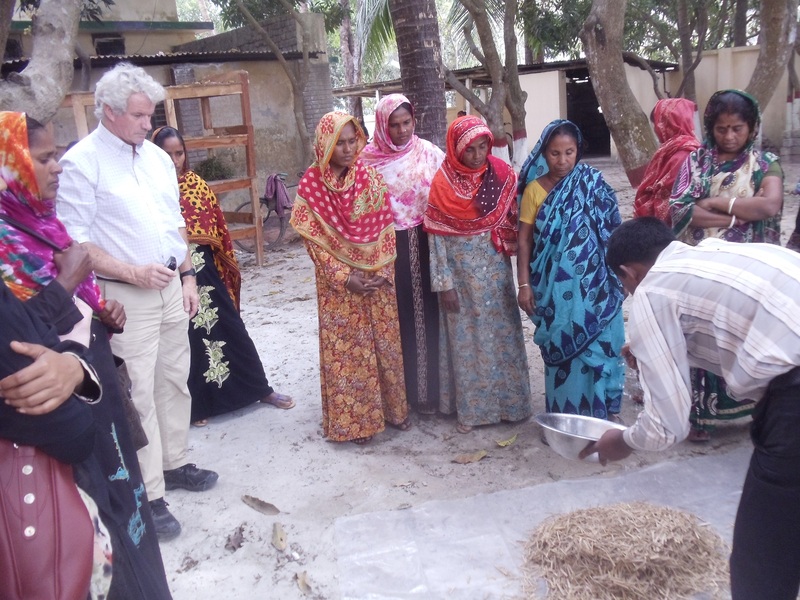 Eman Ali, the founder and Executive Director of this NGO, which has focused on improving people’s livelihoods in this rural area in southwest Bangladesh. Over lunch, Mr. Ali described the wide range of activities that the 400+ employees of SUS have been involved in over the past 30 years. Lunch was the first of many, many scrumptious meals served by the SUS kitchen. I never would have guessed that I would gain weight on this assignment, but the abundant fish, meat, vegetables, and fruit were quite simply too delicious to resist. After lunch, we joined a group of SUS employees to visit a small homestead and a local village to observe typical goat husbandry practices in the area. Of course, the villagers were as curious about me as I was about them. Wherever we went we were surrounded by local people who were ready to answer my many questions about their daily goat-rearing practices. I slept very well at the SUS headquarters, where the accommodations were clean, comfortable and secure. The next day was consumed by site visits to villages and households, where goats are raised for supplemental income. The visits provided a good opportunity to observe and discuss routine husbandry practices, including feeding, housing, and medical care. After lunch we traveled 1 hour south to a homestead located in the flood areas. The farmer reported that his small plot of land adjacent to a medium-sized canal is flooded annually, and thus he is only able to harvest one crop of rice each year. As a result of the flooding, the land is increasingly salinized. A taste of the dirt revealed just how salty it had become. His goats were left to scrounge what they could from the sparse vegetation that managed to grow. The farmer described in detail how he has to relocate his household during the rainy season every year. It was remarkable to see in this case and many other cases, just how vulnerable the villagers are to the indiscriminate effects of climate variability. 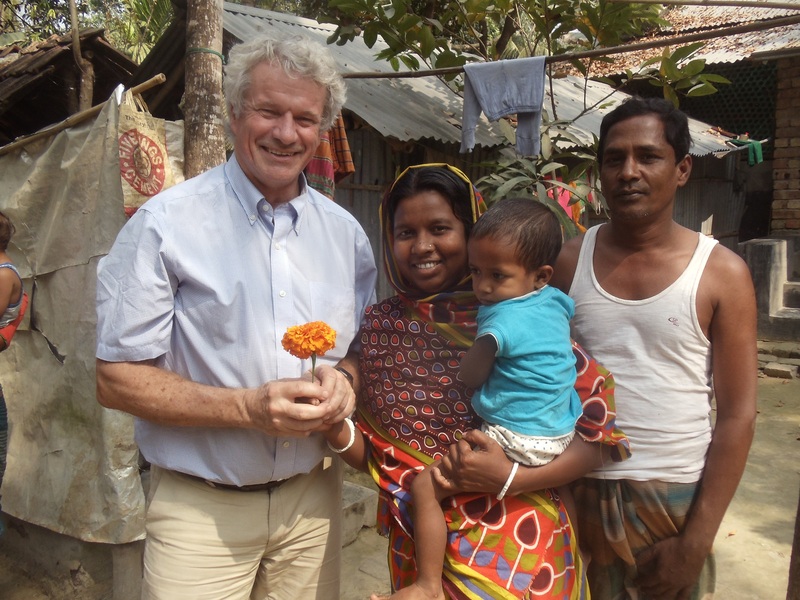 Despite the precarious living conditions, the Bangla welcome was warm, patient, and informative wherever I visited.